Add Hello Kitty World to Your Links! Always want to know what’s the latest news and trends from Hello Kitty? Add this blog to your links and feel free to use these cool banners to liven up your blogs! Hello Kitty stars in her first-ever claymation video on DVD! This 55-minute feature has 5 adorable episodes of your favorite Sanrio characters, including Hello Kitty, My Melody, Cinnamoroll, Pom Pom Purin, and Badtz Maru! Join them in their adventures as they learn and create seesaw nutcrackers, vegetable sunglasses, and a town made of cookies! Originally produced in Korea by its talented animation artists, this DVD is now available in English by Geneon Entertainment. 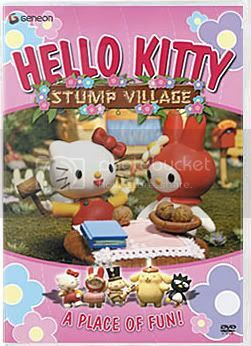 Visit Hello Kitty and her friends in Stump Village today! Sanriotown releases several new layouts for their blogs, featuring the most famous of all sanrio characters, Hello Kitty. The Sanriotown blogs are free upon sign up, with 4 layouts to choose from. Currently in its beta stages, we can surely expect more features once it has been officially launched. For more information, please visit Sanriotown.com. March 20-23, 2007 - Sanrio Digital promotes its new series “The Adventure of Hello Kitty and Friends” in an exhibit booth in FILMART: Hong Kong International Film and TV Market. 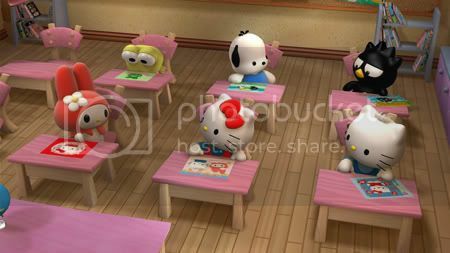 The first ever Hello Kitty 3D anmation series deals with life lessons for children, teaching them about words, numbers, shapes and even languages like Japanese and Chinese. All of Sanrio’s well-known characters, including (image, from top left, clockwise) Keroppi, Pochacco, Badtz Maru, Dear Daniel, Hello Kitty, and My Melody will appear in the series for fans to enjoy. “The Adventures of Hello Kitty and Friends” is a series of 52 episodes, 12 minutes each, and will be released in the third quarter of 2007 in the English language. For more information, please visit Sanriotown.com and Sanriodigital.com. Did you know that Hello Kitty was an Ambassador for UNICEF’s “Go Girls!” Campaign? 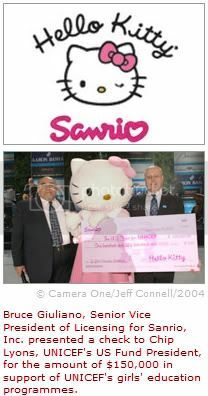 When Hello Kitty celebrated her 30th Anniversary in 2004, Sanrio donated over $150,000 to UNICEF girls’ education programmes to embark on an advocacy programme, educating fans about gender-based discrimination in developing-world schooling. There was said to be some 10 million more girls than boys who are not attending school world-wide. Joining forces with Target Stores, Sanrio gathered acclaimed designers to create special one-of-a-kind Hello Kitty items and sold the items at an online auction that began in September 2004, culminating in a star-studded gala in Los Angeles in November 2004. Proceeds from the auction benefited UNICEF’s ‘Go Girls!’ campaign and Target House. Hello Kitty truly is a special friend to all girls from all parts of the globe.